Have you ever wanted to see a time-travelling lone wolf cop (“I’m a cop. From the future.”) crotch punch Hitler (a.k.a. Kung Führer) in an epic 1980s style action adventure? Well, that’s a very specific fantasy but it’s realized in the insane new short film Kung Fury, a gloriously over-the-top fever dream of cartoonish violence and pastiche of all things supremely 80s, all set to a killer synth wave score and shot through with a healthy dose of absurdity.The crowdfunded film (to the tune of $630K) is the brainchild of Swedish writer-director-star David Sandberg, an 80s super-fan who grew up watching the best and cheesiest that Hollywood had to offer from afar. The dual miracle of Kung Fury, his homage to all things best about the decade of excess, is that not only did he secure financing based only an incredible trailer produced for $5K, but the film went on to play the prestigous Cannes film festival and actually slayed audiences, quickly becoming a fan favourite. It’s an inspiring success story built on the back of an end product that actually lives up to the hype, mostly by being ridiculously entertaining and never taking itself seriously. The story, such as it is, takes place in a seedy Miami (shot mostly in Sweden on greenscreen) that’s overrun with hoodlums and barely held together by the self-proclaimed “best cop alive” Kung Fury (Sandberg). 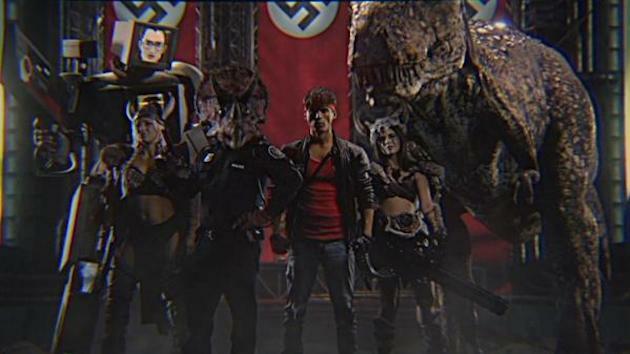 After some quick backstory and an opening battle against an anthropomorphic arcade machine that’s threatening to shoot a puppy, Kung Fury is forced to travel back in time (in one of the film’s many worthy sight gags) to hunt down the the Führer and set things right. Along the way he meets a litany of allies (who get introduced with awesomely stylized title cards) like Barbarianna and Hackerman, as well as a half-man half-triceratops Triceratop (who’s casually introduced as if it’s the most normal thing) and a geriatric but super-buff Thor (with the actor sourced from a famous Reddit pic, “Check out my pecs!”). It leads to a frenzied showdown against Hitler himself, with backflipping tanks, rampaging dinosaurs, and some side-scrolling action straight of a wild video game. There’s so many influences on display (from cop films to cheesy fantasy to arcade standup machines) that no recognizable trope gets left behind. Kung Fury works both as a loving amalgam of all things awesome and 80s (complete with tape distortion, squealing guitar solos, a G.I. Joe-esque animated interlude, and a very well-placed cameo), and an inspiring (and hilarious) testament to the power of imagination. Strange as it sounds, there are things that Kung Fury succeeds at that many larger movies would never even attempt, but it’s best to discover its illicit pleasures and ridiculous one-liners on your own. At 30 quick minutes Kung Fury doesn’t overstay its welcome and instead leaves viewers wanting more, and with David Sandberg quickly become a sought after property in Hollywood it’s likely we’ll see that wish granted soon. Oh, and the best part? It’s available in its entirety, for free, on YouTube right now.